On the evening of Tuesday 18 November Khalid al-Habeel sat surrounded by his wife, family, and other concerned fishermen. Until the early hours of the following day, they had no idea what charges were being laid against 15 fishermen, including two of al-Habeel’s sons, Adham (21) and Mohammed (20), after they were nabbed from Gaza’s territorial waters earlier that morning and taken to an Israeli interrogation center at Ashdod port. Nor did they know when or if their boats — their livelihoods — would be returned. “There are many ships around us; there’s no way to leave,” said Adham to his father. Their boat was approximately seven miles out from Deir al-Balah, in the center of the Gaza Strip. Although Palestinian fishermen have the right to fish up to 20 nautical miles from Gaza’s coast, as laid-out in the 1994 Interim Agreement signed by Israel, since 1996 Israel has downsized this distance in stages, documented by the Palestinian Centre for Human Rights (PCHR). Imposing a sea blockade on Gaza in 1996, Israel illegally reduced the allowable fishing zone to 12 nautical miles. From 2002 to 2003 this was further reduced to six miles from Gaza’s shore. While Adham and the more than 3,500 professional fishermen that scour Gaza’s waters for needed sustenance and sources of income are accustomed to Israeli navy harassment, Tuesday’s encounter was different, heightened. “We’re used to facing Israeli attacks in the sea, but we’ve never seen anything like what happened today. Usually, the Israeli soldiers surround us with a large ship and a smaller gunboat. They shoot at and around our boat with automatic rifles, and they water cannon the boat. When they arrest us, they make us strip down to our underwear, jump into the water, and swim to their ship where we are then hauled up, handcuffed, and taken away to an Israeli interrogation center and even arrest. Today was very different. It’s the first time they’ve actually boarded our boats,” al-Habeel explained. Khaled’s brother, Abed al-Habeel, and the father of another of the arrested fishermen, Rami (30), corroborated the testimony, adding that their greatest worry was the boats right now: “In the past, I’ve had my boat confiscated. It was three years ago, and the Israeli soldiers arrested Rami, who was fishing four miles off the coast. They held him for four months, and kept our boat for 70 days. This was a huge loss to us, and when it was finally returned to us it had been seriously damaged by the soldiers’ shooting. The nets, the motor, everything was destroyed or stolen,” he said, adding that the total losses and damages amounted to US $40,000. “We’ve done nothing wrong. We are innocent, just trying to earn our living. Our boats are our only source of income,” said Abu Adham. “But what can we do?” he asked. The two al-Habeel fishing trawlers and equipment together amount to approximately US $280,000. With the entire family being either fishermen or dependent on the livelihood and food source fishing provides, the confiscation of their boats is a severe blow to the family. In an area which has already been devastated a siege on the economy, exports, health sector, education, and basic existence of Gaza’s 1.5 million Palestinians, the fishing sector is one of the few reliable sources of income and food. According to Abu Adham, it is not only his immediate family which is punished by the boats’ confiscation. “Our boats are like a company,” he said. Around 300 people in total are affected by the loss of their two trawlers: other workers employed on the boats, at the docks, in the fish market, transporting fish goods, as well as the buyers themselves who have come to rely heavily on the sea’s offerings as a source of protein and nutrition at a time when red meat is scarce and very expensive. Since September 2008, after the arrival of the Free Gaza boats, human rights observers with the International Solidarity Movement (ISM) have been traveling with Gaza’s fishermen, into waters further out than the arbitrarily-imposed six-mile limit. 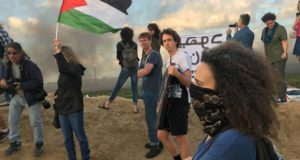 The observers have documented numerous instances of attack at the hands of the Israeli army, from as little as three miles from shore, including being shot at with live ammunition and shelling, being water cannoned — during which soldiers specifically target the boats structural components, particularly breakables like glass, glass panels and machinery — and more recently being doused with a foul, sewage-smelling water shot from the water cannon. The Israeli human rights organization B’Tselem has documented testimonies of fishermen who suffered harassment and arrest, had their nets cut, and boats and equipment confiscated, often returned with broken and missing equipment, and costly damages to key boat structures. In the early hours of Wednesday, 19 November, all 15 arrested fishermen were released to the Erez crossing into Gaza. Their boats, along with the three internationals, are still being held by Israeli authorities. Nidal, a 23 year old father of one child, was among the arrested fishermen. 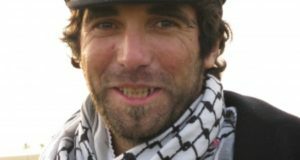 Italian volunteer Vittorio Arrigoni (“Vik”) (33) on the 2nd boat to be surrounded, continued filming as Israeli soldiers boarded the boat. Colleague Darlene Wallach (57) was on the third boat and related via phone what happened next. “They used a taser on Vik while he was still on the boat, then tried to push him backwards onto a sharp piece of wood. He jumped into the sea to avoid being hurt more than he already was, and was in the water for quite a while,” Nidal said. Mohammed confirmed this account, adding, “This was the first time we weren’t forced to strip and jump into the water.” Three soldiers remained on Mohammed’s boat and, after the operation was repeated on the third boat, ordered Mohammed to head towards Ashdod, the first Israeli port, along with the other two fishing vessels. Later, at the Ashdod port, during their interrogation, the fishermen were questioned specifically on the international observers. “Why did you have internationals on your boat?” they were asked. “Who is responsible for sending the internationals? Who pays them? Where do they live? Do you get a good catch when the internationals are on board?” the questioning continued, with a very specific and evident interest, including a non-veiled threat: “You think that you have protection because you have internationals on your boat? Let’s see what these international can do for you now,” one fisherman said soldiers threatened. After their half-day detention, the fishermen were released without any charges, although their boats remain confiscated. On 21 November, the three began a hunger strike, calling foremost for the return of the fishing boats, and further calling for their own return to Gaza. The incident comes just a week after a delegation of 11 European Members of Parliament, all denied entry through Egypt’s Rafah crossing, visited the Gaza Strip, arriving via the third Free Gaza voyage. Amongst the delegation were: former UK Secretary of State for International Development Clare Short, Lord Ahmed Nazir, and Baroness Jenny Tonge. Tonge condemned the arrests. Clare Short’s comments addressed not only the recent arrests, but the devastating siege which has been imposed on Gaza for 18 months now. “I am pleased that the fishermen have been released because they should never have been arrested. But their boats must immediately be returned to them, otherwise their livelihoods are lost and the wrong has not been righted. The siege of Gaza must be lifted and the UK must insist that these illegal attacks by the Israeli navy on Gazans, fishing peacefully within their own water must cease,” Short remarked. Indeed, while the arrest of the 15 fishermen and three internationals highlights the continual and systematic injustice fishermen face, over 11,000 Palestinian political prisoners remain incarcerated in Israeli prisons and the siege on Gaza’s 1.5 million civilians worsens ever still. While Israel is seemingly trying to conceal the alarming deterioration of humanitarian conditions in Gaza by preventing journalists from entering Gaza for over 13 days now, pressure is growing, from European parliamentarians to UN officials, for Israel to end its siege. 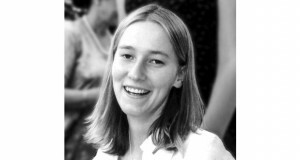 Eva Bartlett is a Canadian human rights advocate and freelancer who spent eight months in 2007 living in West Bank communities and four months in Cairo and at the Rafah crossing. She is currently based in Gaza, after the third successful voyage of the Free Gaza movement to break the siege on Gaza.